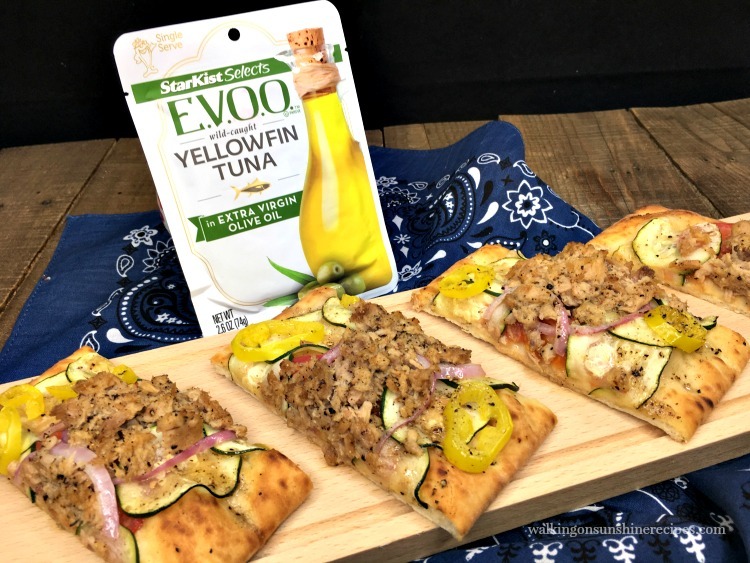 This Flatbread Pizza with Veggies and Tuna is a sponsored post written by me on behalf of StarKist Selects E.V.O.O. 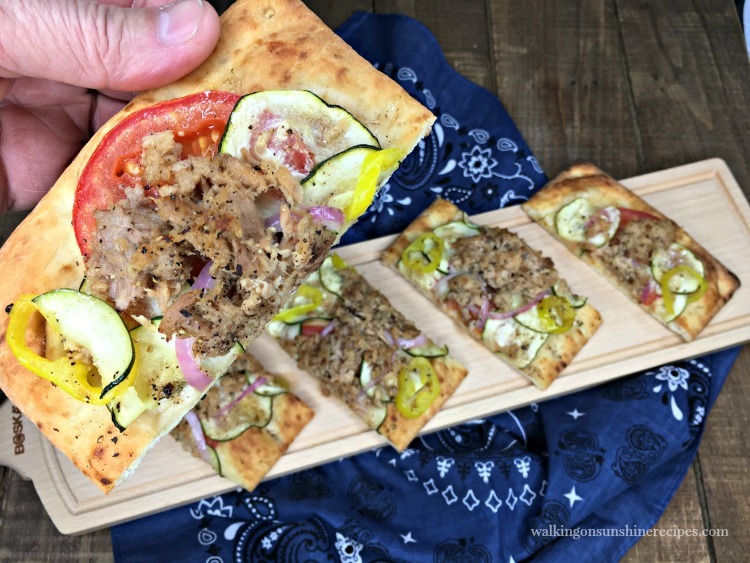 Flatbread Pizza with Veggies and Tuna is not the traditional pizza you usually see when you come to my blog for a pizza recipe. Followers of my blog know that my family loves pizza. The Christensen’s have a long-standing tradition of serving up homemade pizza every Saturday night! The recipe I’m sharing today is a radical departure from the traditional pizza recipes my family enjoys. 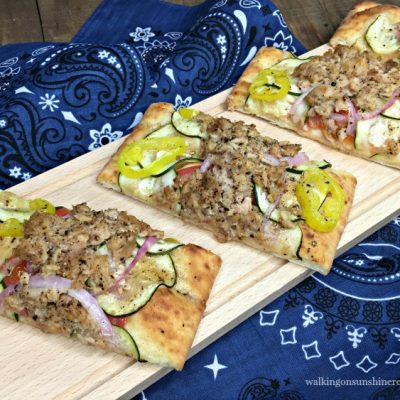 That being said, I just know you’re going to love this recipe for Flatbread Pizza with Veggies and Tuna. My husband loves tuna and enjoys taking a tuna packet with him to work for lunch at least once a week. I thought, why not try tuna in a recipe for dinner one night? My husband comes home particularly hungry on days when he works his second job. Because the hour is often late, he prefers something he can heat up right away rather than a traditional dinner. I purchased a flatbread pizza crust at the grocery store this past week, and thought it would be the perfect starting point for a quick late night dinner. I started by drizzling salad dressing instead of tomato sauce on top of the flat bread. Then I chose to use the StarKist Selects E.V.O.O. Yellowfin Tuna as the protein and added sliced tomatoes, red onion, zucchini and yellow peppers. The result? 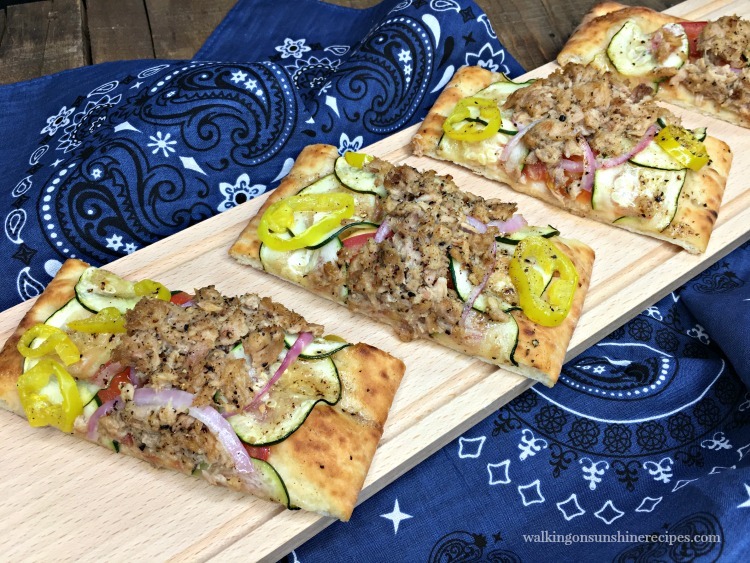 My husband loved the Flatbread Pizza with Veggies and Tuna and had the leftovers for lunch the next day. StarKist Selects E.V.O.O. Tuna is packed in cold-pressed extra virgin olive oil and has a rich, mild flavor with excellent texture. The label is easy to read with few simple, quality ingredients and it’s from a brand we all love and trust. The StarKist Selects E.V.O.O. line also has Yellowfin Tuna with Sun-dried Tomato and Pink Salmon options. But more importantly, StarKist Selects E.V.O.O. 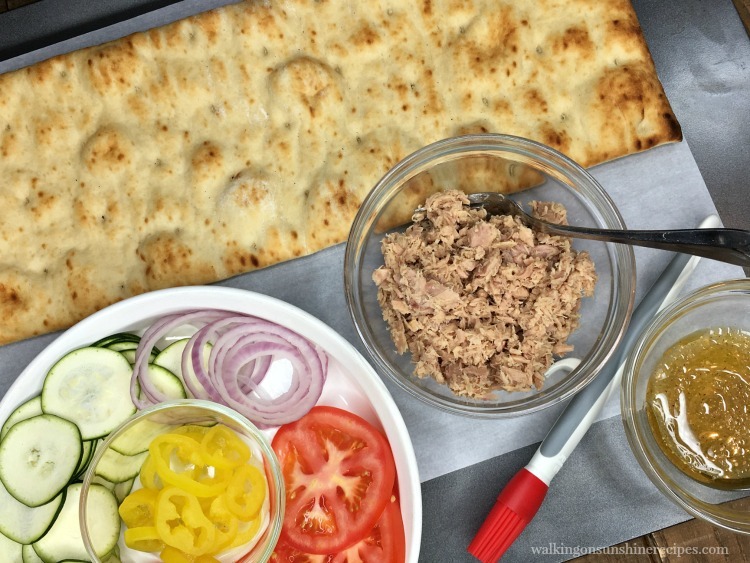 Tuna makes for a perfect quick lunch at work or an easy dinner! 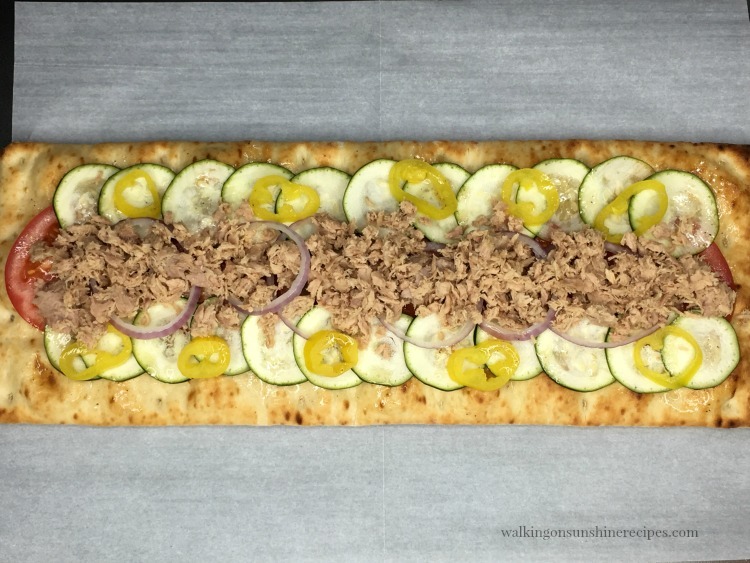 Here’s what you need to make this Tuna Flatbread Pizza. Drizzle your favorite salad dressing on top of the flatbread and then start layering your favorite vegetables. I chose to slice the tomato, onion and zucchini really thin so it would cook fast. Then I added the yellow peppers. Make the pizza pretty! We eat with our eyes first, so take your time when you lay out the veggies on top of the flatbread. I used two packets of StarKist Selects E.V.O.O. Yellowfin Tuna on top of the vegetables. I drizzled a little more of the salad dressing on top so the vegetables wouldn’t burn while cooking. Bake in a 425 degree oven for about 15 minutes or until everything is heated through and the crust is slightly browned. You can definitely use a store bought pizza dough for this recipe as well. Or even make your own pizza dough! A delicious late night dinner for my hard-working husband. We will definitely be making this again! Serve with a side salad for busy weeknights when you need to get dinner on the table fast! We loved using a salad dressing as the base for the pizza. The tuna warmed up nicely in the oven too! Here’s a close-up of the Tuna Flatbread Pizza. Yummy! 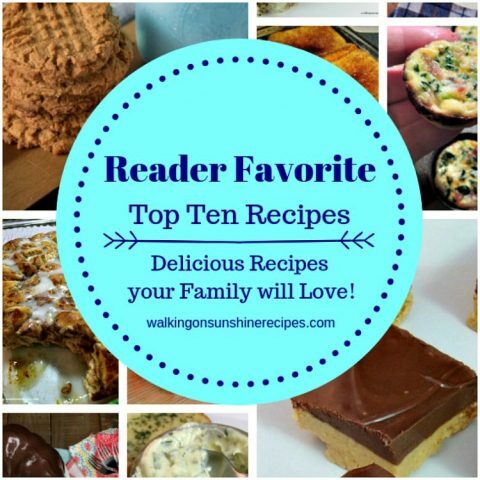 An easy recipe for dinner on busy weeknights or a delicious recipe for a late night snack. 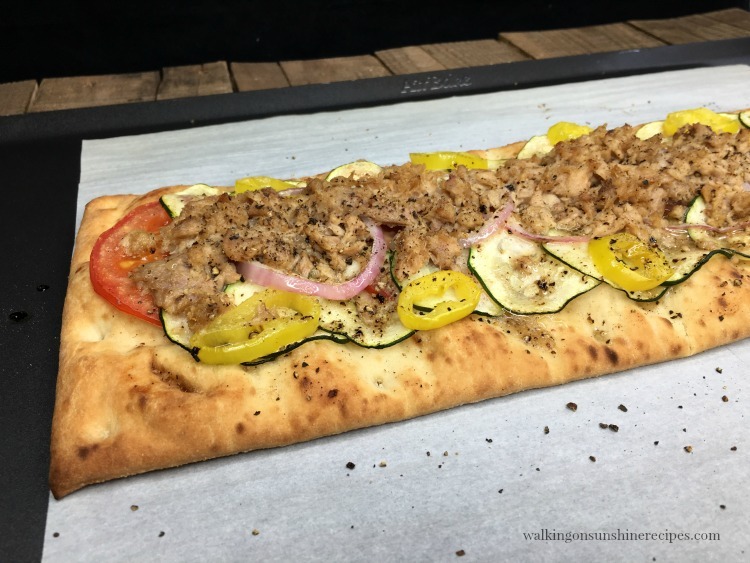 Tuna on top of a veggie pizza is a great option! Lay the flatbread pizza crust on a baking tray that has been lined with parchment paper. 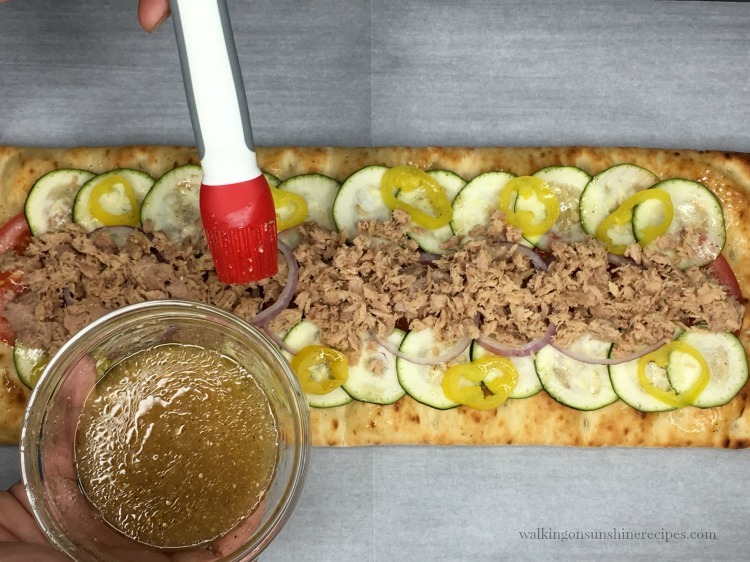 Using a pastry brush, spread about half of the salad dressing on top of the flatbread pizza crust. 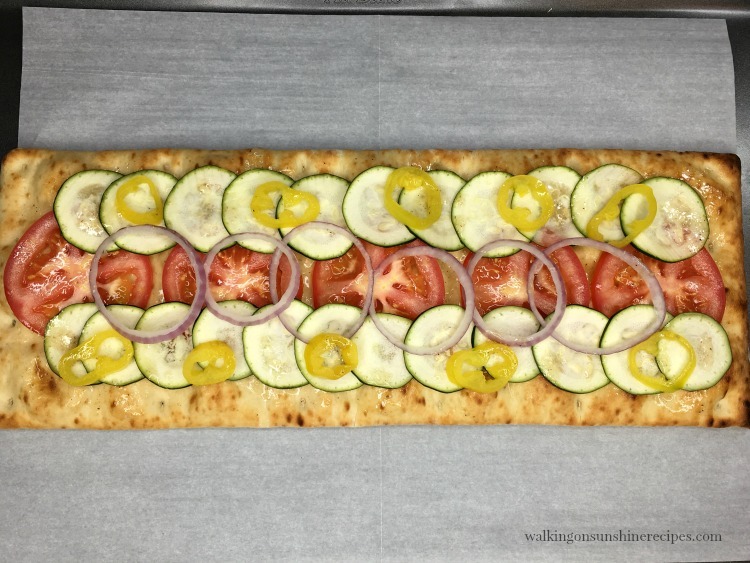 Lay the tomatoes, zucchini, red onion and yellow peppers across the flatbread pizza crust. Add the StarKist Selects E.V.O.O. Yellowfin Tuna on top of the veggies. Drizzle the remaining salad dressing on top of the veggies. Bake in a preheated 425 degree oven for about 15 minutes or until the veggies and tuna are heated through. I love your pizza tradition. We used to have pizza on Friday nights. 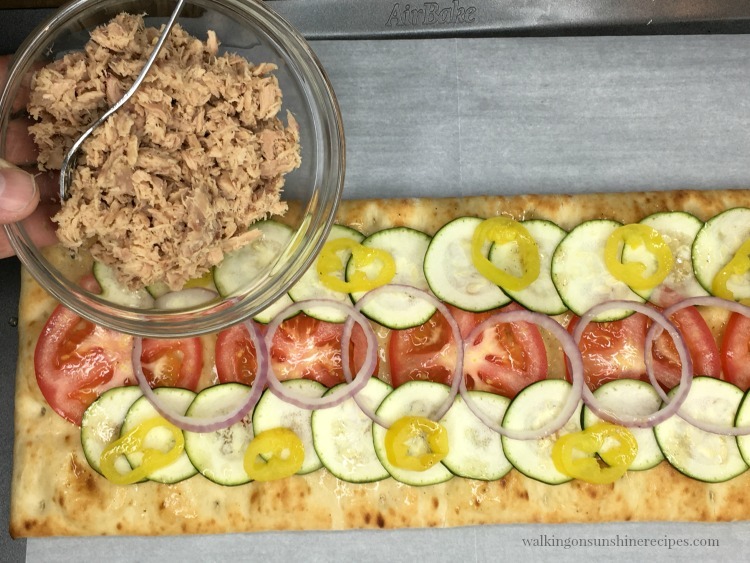 Also, great idea with the tuna flatbread looks delicious. Hubby makes the pizza most Saturday nights now. He loves it too! Thanks for visiting. What a great idea for a quick dinner on a busy weeknight! I love how easy it is to make! Yes and even better late at night for my hubby when he gets home after a long day of work. Thanks for visiting. Using a flat bread is such a great idea!!! It turns pizza into a quick and easy dinner, rather than having to wait for dough to rise!!! LOVE IT!!!! The toppings look so fresh on this pizza….I am loving the italian dressing and lack of cheese. That is a healthy pizza right there! Yum! My goal was to make a healthy QUICK pizza and I think this turned out great. Thanks for visiting. Yes! I love adding veggies to pizza too. 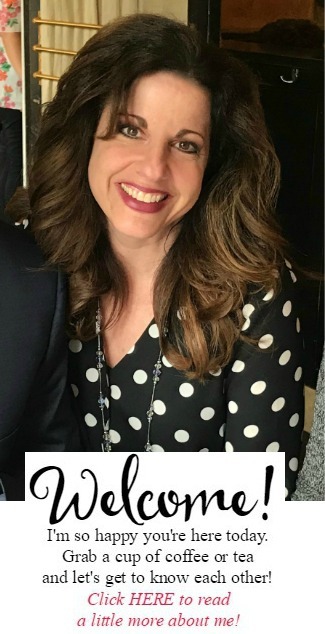 Thanks for visiting Hope. I like this kind filling appetizers to make it for get together. Love this flat bread pizza with fresh veggies and tuna. I need to give it a try. I never even thought of that! That’s a great idea. I’m having company soon and will make this recipe for them as our appetizer. Thanks for visiting. This is such an easy recipe to make on busy nights. Thanks for visiting Elise!